The Women Human Rights Defenders International Coalition (WHRD-IC) is urging the Honduran authorities to guarantee the safety of Berta Zuniga Cáceres and other members of the Civic Council of Popular and Indigenous Organizations of Honduras (COPINH) following an armed attack on 30 June. Berta Zuniga Cáceres, General Coordinator of COPINH and colleagues Sotero Chavarría Fúnez and José Asunción Martínez, were returning to La Esperanza from Cancire Community in Santiago Puringla municipality. They had been discussing strategies with the Indigenous Council for defending territory and the environment in Cancire. At around 2:36pm, while on a rural road, a vehicle overtook theirs at high speed. A few metres ahead, the same vehicle stopped in the middle of the road. Three individuals with machetes and the driver stepped out of the vehicle and stood next to it in a threatening manner trying to hit the defenders’ vehicle with the machetes. The driver was able to avoid them, but one of the armed men threw a stone at their vehicle that hit the windshield. A few minutes later the same vehicle overtook COPINH’s car, but with only the driver inside. The driver then tried to force COPINH’s vehicle off the road. The attacker’s car remained in front of COPINH’s car at a slower speed. COPINH members succeeded in losing their attacker once they reached an urban area. Berta Zuniga Cáceres is one of the daughters of Berta Cáceres, winner of the 2015 Goldman Environmental Prize assassinated in March 2016 after a string of attacks and threats. 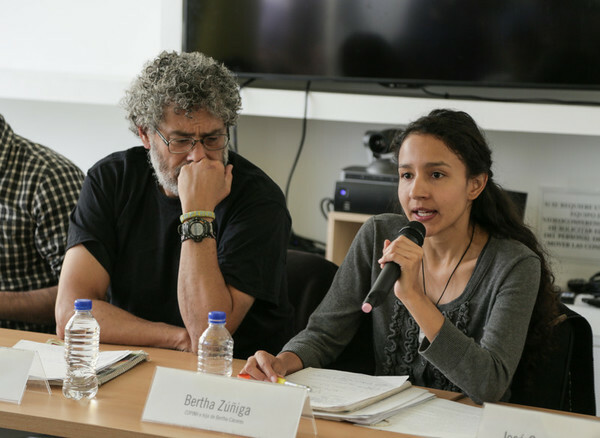 As Berta Zuniga and other members of COPINH continue defending indigenous and environmental rights they have also been targeted repeatedly and their safety is at serious ongoing risk. Earlier in June, Sotero Chavarría Fúnez said that two unknown men were asking for his whereabouts in his hometown and unknown men tried to kidnap the mother of his children in a vehicle. On 21 June, an unknown man threatened Francisco Javier Sánchez, another defender with COPINH, with a pistol while he was working the land and said he would kill his children. Despite national and international calls to ensure protection for COPINH members and justice for Berta Cáceres’ murder, very little progress has been made. This lack of progress is allowing further attacks to take place. publicly recognize the legitimate and rightful human rights work done by COPINH and avoid actions and statements that delegitimize, stigmatizes, abuses, disparages or discriminates or victimize the organization and the communities associated to them. take all necessary measures to ensure an enabling environment for civil society organizations, including COPINH, can carry out its human rights work. in the defense of the rights of the Lencas communities and their territories. ← The WHRD IC stands in solidarity with those arrested in Turkey and calls for their immediate release.